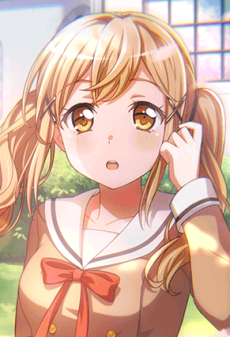 Arisa is a first-year student at Hanasakigawa Girls' High School and the keyboardist of Poppin'Party. In the second season of the anime, she is a second-year student and the student council secretary. Arisa's grandparents run a pawnshop called "Ryuuseidou", and she lives in a big and traditional house, which includes a basement where the Poppin'Party members practice most of the time. When Arisa was younger, she started to learn the piano but then quit it halfway because she didn't have any motivation to continue - when she befriended Kasumi and heard about her plans to start a band, she picked it up again. Arisa is an introvert whose hobbies include tending for bonsai plants and internet surfing. Even though she's basically a shut-in and admits being lazy by nature, she still manages to achieve excellent results in school. It was shown that in the past that Arisa was a lonely type. She is also quite moody and grumpy, and because of her sharp tongue, often gets into arguments with others (especially Kasumi). Usually, however, this is because she is unable to be honest with herself.